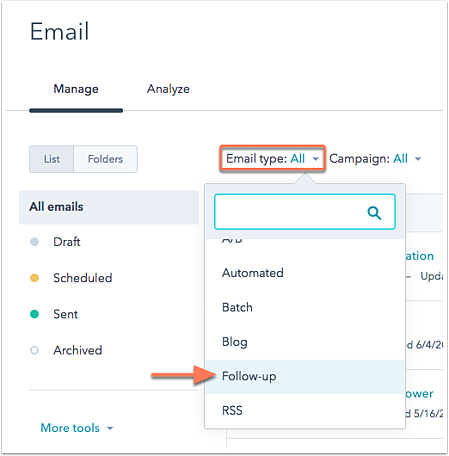 If you have set up a follow-up email on your HubSpot page, you can update its content by accessing it from the form options in the page editor or from the email dashboard. Hover over the name of the page and click Edit. In the left pane, Post submit actions section, ensure the Send a follow-up email checkbox is selected. Under the dropdown menu, click Edit. If a follow-up email is not selected, or to edit a different follow-up email, click the dropdown menu and select a follow-up email, then click Edit. The email editor will open in a new browser tab. Edit the email in the Edit and Settings tabs. When you're done, click the Review tab and review the email settings. In the upper right, click Update. In the upper left, click the Email type dropdown menu and select Follow-up. Hover over the follow-up email you want to update and click Edit. Edit the email in the Edit and Settings tabs.